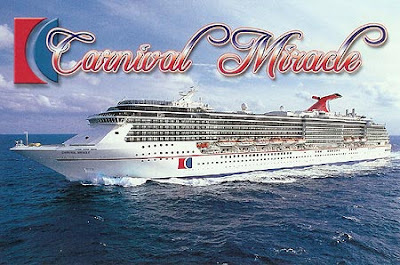 Day 9 - 16 are aboard the Carnival Miracle. We'll board the afternoon on 1/31 .. she's running late after a small incident in St Kitts. We'll be going to Panama, Costa Rica and Belize .... I'll, of course, not be posting as internet costs can be quite high and I'd rather spend my money on drinks of the day. I'll possible backlog it .. we'll see. 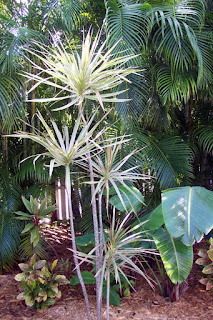 We left Miami and made the short drive up the road to Ft. Lauderdale. We stopped at Target on the way out and didn't happen across a single English speaking person. Such confusion; isn't Miami part of the United States? Besides that, the traffic is ugly and the construction is worse than Houston. I'm sure Ft Lauderdale is much the same, but we did our best to not notice. 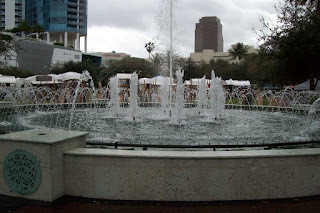 First stop (planned) was the National Art Festival at the Fort Lauderdale Art Museum. This is a juried event and everything fell into fine art categories; paintings, photography, sculpture, and jewelry. The only textiles I saw were finely handbraided rugs and some custom, and esquisite clothing. I was surprised by the smaller number of arists on hand; I guess somewhere around 50. I was curious if that was due to the economy or if this is usually a smaller event. The event was outside the Art Museum in a lovely setting. On the backside of this fountain, they had set up about 15 easels and were allowing anyone interested the opportunity to paint. (Believe there were some type of instructors standing by). I've misplaced this artist' card and could just kick myself ... her work is lovely and I'd like to see more. When I first reached her tent, there was a man sitting in the back of the tent. 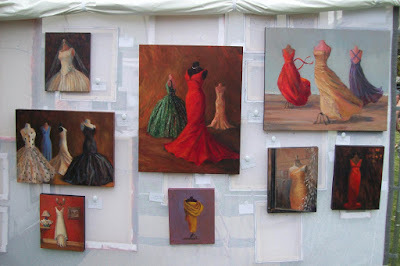 As I browsed around, I kept thinking how unusual for a man to paint these wonderful dresses. Then, I caught up with my husband, talking with the actual artist (her husband/helper was in the chair). I asked her if she had meant to be in the fashion industry and she explained in Barcelona she saw dresses through a window and fell in love with the fabrics and texture as light reflected from them. Although these particular works would not fit with my decor (or budget), I find them incredible. After the show, we took in some lunch at Chili's and headed 15 miles the other direction to visit Sawgrass Mills. To quote the survival guide "What has 2.1 million square feet of space, is shaped like an alligator and draws nearly as many annual visitor as Disney World? 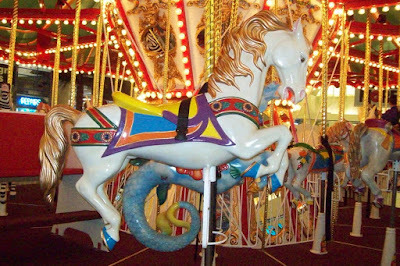 Sawgrass Mills Mall. What takes a day to walk through, has slow-moving cattle-like crowds and acres of parking lots with no empty space in sight? 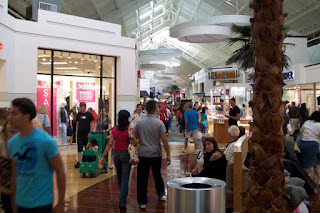 Sawgrass Mills Mall." This place is a zoo. No ... it's more than that. It has more folks shopping on this Friday than the busiest Mall in New Orleans has shopping on Black Friday. First off, there must have been 5000 cars in the parking lots (which should have discouraged us to begin with), but once inside it got wild. We wandered, aimlessly (I couldn't think of a single thing I needed), until the whole exercise seemed pointless and it was like "let's get out of here". Which we did. 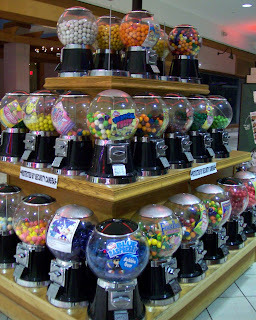 Now, I understand that this would be a shop-a-holics dream come true, but I can definitely put this on the list of places not to return. My feet are tired and I'm getting abit cranky; good time to quit for the day. So, we went and checked into our hotel for a little R&R. Tomorrow starts the cruise .... although we heard it had a small incident in St. Kitts and is going to be a couple hours late .... oh well. Over the last two days, we've met a variety of folks who are a part of the renouned snowbirds. 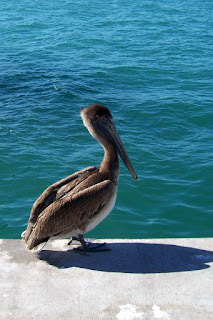 They come from cold country, live in RV's and spend 3 - 4 months a year in Key West. Even though we do not come from actual cold country, it's easy to see how it could move from a dream to a reality. (Particularly if I had room to bring some of my art/craft stuff). But, reality is reality and it was time for us to move on ... we have to be in Fort Lauderdale for Sunday at noon. So, we packed up, filled the car with gas and headed on out. 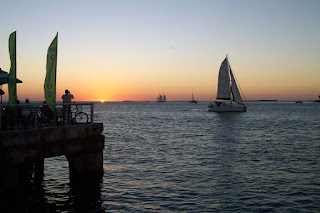 The Florida Keys are incredible, each mile bringing a new sight, which almost always includes water. If you've not been here and get the chance, I highly recommend the experience. As I drove by, I thought "are those bikes?". So, I as soon as I could, I turned around and came back. 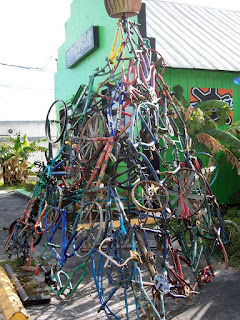 Yep, a bike sculpture. How fun is that! I' say it stood about 10' tall and 15' wide. The view from an old bridge that has been turned into a fishing pier. 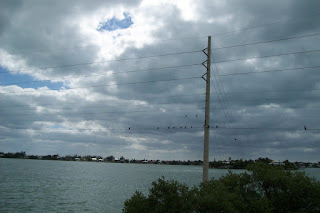 In many places, birds line the electrical wires. 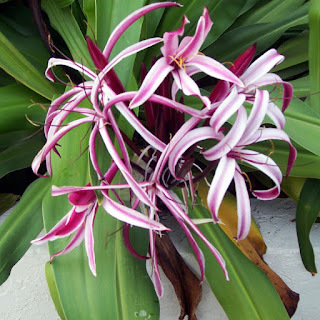 Some type of Lilly outside a library, where we stopped because a sign advertised a book sale. (One should never pass a book sale). 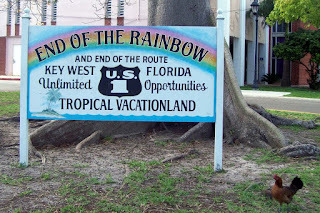 The primary stop ws in Florida City (Homestead), at theEverglades, Royal Palms Visitor Center and Trails. 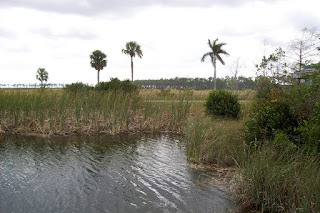 We watched a couple films in the visitor center and quickly had our misinterpretation of what the Everglades are ... no more thinking of them as swamps and then started out on a couple small hikes ... the most active being the Royal Palms Trail. This is an incredible area and we've already started talking about coming back in a couple years and spending most of a vacation here. Then, back to the car and drove just above Miami to an area called Miami Lakes. Of what I've seen, I'm mostly looking forward to leaving. Which will be fine as this was just a place to spend the night. 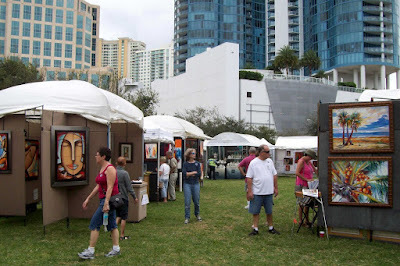 Art show and museum in Fort Lauderdale planned for tomorrow. It is still windy (20 - 25 knots), but the sun is shining brightly and the weather is going to a high in the upper 70's, degF. Certainly nothing to complain about. Although it's warm, the water temperature is quite cold, and for many of us (like Beau & I), that is eliminating the water sports that are so prevalent here. No way I'm swimming in the gulf, jet skiing, snorkeling or anything else that involves putting my body in the cold weater. And, no way I'm putting on anything that resembles a wet suit .... if they even come in my size ! So, the day was a bit of a repeat of yesterday. Breakfast at IHOP (International House of Pancakes), because it's right next door. Their portions are way to large and if you eat it all, you can feel quite lousy. So we were smarter and ate only half. I suppose, if we'd been real smart we would have decided on one and shared. Sat by the hotel pool, it's lovely and has it own little tiki bar. Beau's loves reading and I'm working on little colored pencil drawings for upcoming fiber projects. Off to town. The main street Duval is quite divided, one end is fairly decent with nice shops and galleries, the other end is abit skanky with lurid teeshirts, cheap jewelry and folks trying to coax you into bars with 2 for 1 specials. (Kind of like being in New Orleans French Quarter, which we seldom do at home). We explored some side streets, looing at the forts and how the local lives, and the incredible amount of street art. Happy hour at Kelly's again. And yes, thats where we went yesterday and we should have tried somewhere else, but their Wings and Key Pie Margaritas are just sooooo good. We did better; ate and drank much less. Drove just up from the Southernmost point and walked on the beach and piers. Picked up Quiznos sandwiches, which we ate on our room balcony, which has a wonderful view of the ocean. We had hoped to partake of local foods/restaurants, however, had difficulty 1) finding them, and 2) the couple we found, parking is non-existent. It appears that the majority of the locals ride bikes and mopeds ... parking is a premium .. I'm glad we came here. Beau had a great suggestion. Tomorrow morning we pack up and had back to more Northern Points. Believe the goal for tomorrow night is Ft. Lauderdale .... a couple things going on there, and of course, that's where our Carnival ship is sailing on Sunday afternoon. 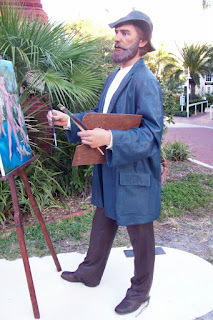 There ae literally dozens of art statues, paintings on side of buildings and color ... natural and art inspired, everywhere. The sky is clear, the sun is shining and the temperature is sitting nicely around 70. It's quite windy; wind blowing between 20-25 knots. (wonder why wind is measured in knots in southern florida ... in New Orleans the measurement is MPH). The wind hasn't been much of a factor, however, in that the building and plantings form exceptional wind breaks. We carried out our simple day 5 plan. 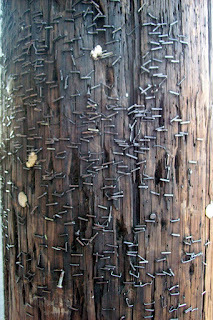 A telephone pole on Duval St. covered with staples of the many communications that have been posted. These type of signs always get me in an uproar. Time and history measured only in terms of when the Europeans reach the U.S. No sense considering that the native indians had been drinking water from this area for centuries before the Pirates made the claim (and probably killed off most the locals). I'm sure Beau is quite thankful we saw this before I started on my 5 margaritas. Daily Mascot. Wherever we go seems like there is always a mascot standing by to be photographed. I always like to think of this as their jobs. You know, Bird A has the 1-2pm shift, next bird, 2-4pm, etc. etc. etc., under the job title of 'tourist entertainment'. 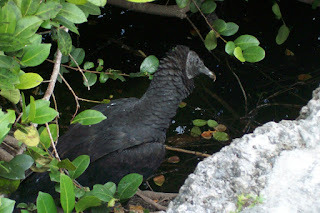 Nothing, except perhaps dinner, appealed to us in Fort Myers so we decided to bypass looking around; loaded up the car and moved on down the road. I'd call the drive SENSORY OVERLOAD. 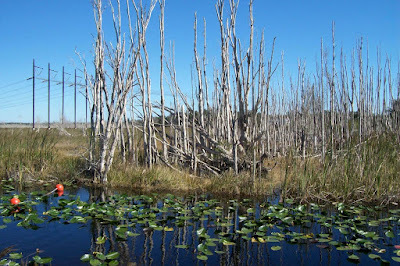 I've never been near the Everglades before and the scenery was everychanging ... second by second. 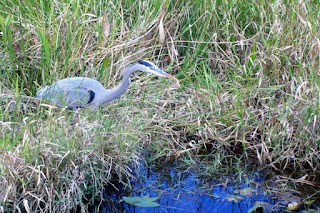 Marsh, water, birds, trees, palms, flowers, bridges ... on and on and on. So much to look at going by the window that it was hard to really appreciate any single thing. Beau was driving, and he'd say, if there's anything you want to stop (which would be pull over on the side of the road) let me know. But, by the time you could get out the request, the site was gone and being replaced by yet another. 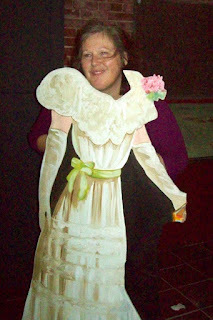 So, for the most part, very few pictures were taken. I'll be doing the driving out so I'll have the control on how fast we are going and when to stop. 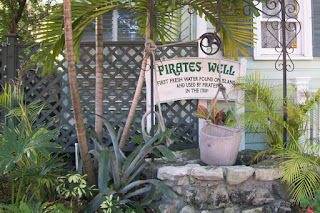 I was able to make reservations at The Inn at Key West (for three nights). After several days in and out of the car, it's great to be staying somewhere for a couple days. This is a wonderful hotel, huge rooms and great ocean view. They are quite accomodating .... notice the extra delivery of beer, for Beau. Spent a couple hours wandering Duval Street (reported to be the hotspot), where they have alot of shops, art, alcohol and food. We ate dinner at Jimmy Buffetts Margarvitaville (Beau loves Jimmy Buffett music and we've eaten at a variety of them) which was a thumbs down event; perhaps the worst service we've experienced in the last year. We'll go back tomorrow (to Duval St, not Margaritaville); I like to look at the art, Beau likes to watch the people and we both like to eat and drink. I'm a pretty big fan of Salvidor Dali. Beau had picked up a flier at the border indicating there is a Salvadore Dali Museum in St Peterseburg ... which was quickly added to our Monday list. Cost was $25 for the two of us (Beau gets that great senior discount), which was money well spent. We arrived right at the start of the tour, which was given by a well spoken gentlemen. Our guide gave us a great deal of history and insite into Dali and pointed out holograms and optical illusions that, honestly, we never would have caught on our own. Apparently this is the largest collection outside of Spain. If you are even in St. Petersberg, I'd mark this as a highly recommend! 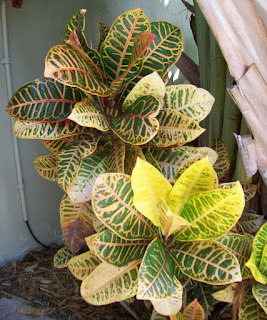 From there, we headed South with the idea that we'd go to Sanibel Island and look for shells, browse a few shops. The three hour drive was a pleasant, but quite windy, drive. Arrived in Sanibel, all ready to do the stoup, to find there were no rooms available ... WHAT ... it's a weekday in January. So we called Comfort Inn and picked up a room reservation in Ft. Myers. Arrived at our hotel, it's nearing 6pm now, and I'm getting a bit cranky. The A/C didn't work in our room, so we requested another. Moved to that room to find it was two double beds; not what we had in mind, so again was moved to another room, where the electric didn't work in half the room. WRONG. So we went back to the lobby where I helped the woman understand she was refunding our credit card and we were leaving. Checked into another hotel, which was much better. A little barbecue for dinner and an ultra-slow wi-fi connection. I'm still abit cranky, but tomorrows another day and I'll start fresh. We had the day planned, we were going to visit the Maclay Gardens to get a small bit of exercise and see acres of camellias in bloom, then to the Natural Bridge Battlefield, because Beau is a history buff, then a jaunt through the Mary Brogan Museum of Art, where there is a Kinsey exhibit in progress. But, we woke to a very steady rain. So, it was a quick replan of the entire day, since the Museum didn't open until 1pm on Sunday. So we drove down to Micanopy, bypassing Gainesville (an avid LSU fan cannot be seen hanging around there), where we spent a couple hours browzing around in the shops and such. I purchased a wonderful handmade art hairclip and a stone choker for our son. 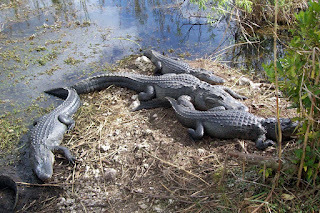 Then, down to Ocala for some lunch and a visit to a rather dumpy, but quite huge, flea market. We bypassed the vendor sections and wandered the aisles of individuals selling their misc. junk ... woops, stuff. We don't have these type of events in our community; suppose we are too uppity or something. Halted the day in Tampa and checked into our hotel. The Saints/Viking Game was a must see and we parked our behinds at the bar of Outback Steak House, where we ate, drank and cheered on The Saints. 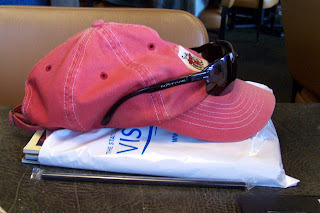 Rick Rack: I picked up 14 packs of Rick Rack at the flea market for 10 cents a pack. Couldn't beat the price and it seemed a fun thing to do. 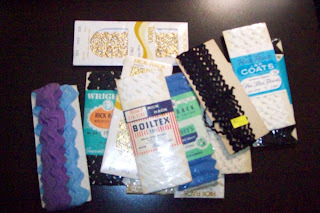 It reminded me of 2 years ago when we were at my sisters in Powell and I found Rick-Rack in her sewing room and gave her a bunch of s**t about it. Rick-Rack is a memory of Mom. Our mother, who is she hadn't had to figure out how to raise four of us kids on minimum wage would have been a fashion designer. Mom could design and sew us cute, and sometimes remarkable dresses, and then ruin the entire thing by adding in rows of rick-rack for decoration. I've been on an Rick-Rack revolt for years. And, some of ths batch may date back to then ... a couple are showing the original price of $0.13. Here's thinking of you Mom. While drinking my morning coffee, I decided to watch part of a 'Elvis Costello, Spectacle with Bruce Springsteen' that I'd tivo'd a few days back. As usual, I was more reading and doing other things than watching, but one phrase caught my attention .... "It wasn't what I was expecting". I've been thinking about this for the majority of the day. Just what was I expecting? Was this what I was going to be, where I was going to live, what I was going to look like ..... Or, is this simply my present and I should be figuring out what I'm expecting for the future? Thanks alot Elivs & Bruce. The first day of our vacation, is usually about getting somewhere .... moving on down the road. And, that we did. 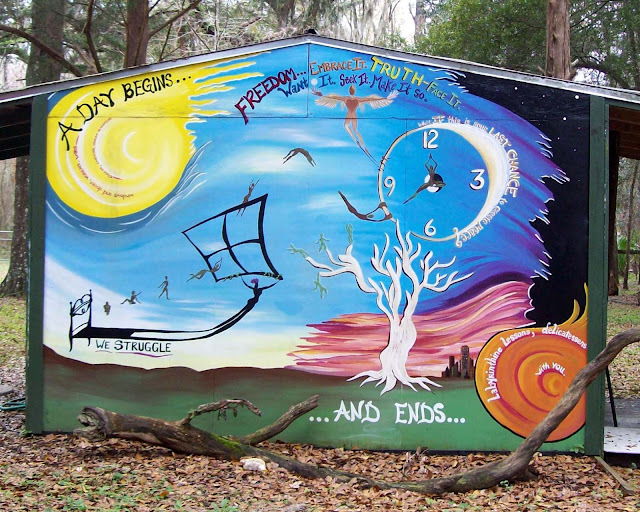 Today we left Mandeville (just a sneeze north of New Orleans) and drove to Tallahassee, FL. Usual first day travel ... appreciated some tile work in a bathroom at the Mississippi border and watched some birds have a fight in an Oak tree, collected dozens of fliers at the Florida border visitor center, lunch at Ruby Tuesdays, book shopping at Barnes & Noble, a stroll through a mall, Dinner at Subway because we weren't very hungry after the large lunch, and a night of each others company at the local Comfort Inn, where we'll start making our plans for tomorrow .... either Gainesville or Tampa. Before we go on vacation, I had to set-up a visit with Lilly. I so treasure our time together. Our big surprise for this visit was kisses. That little sweetheart learned how to kiss!. We were on the floor playing musical instruments and she walked right over and kissed me. Good thing I was on the floor ! When you only see a child monthly, every visit renders new surprises and amazements. It's so much more than growth on a chart, it's personality developing. I love her so much it's like my heart is a sponge just soaking it all up. I know I'll be setting up another visit as soon as we get back. Tomorrow we start vacation. The concept is mostly loose. 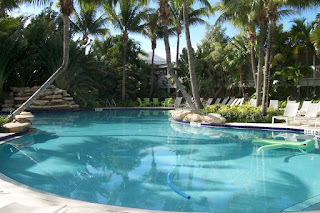 We spend a week driving to Ft. Lauderdale, where we'll catch an 8 day cruise and then spend another week driving home. Other than the cruise, there is no scheduled events or set itinerary. We'll go where we are drawn. So, today is a day of getting ready. Packing what's needed and then, packing the car. Then, comes the cleaning. Beau is not real up on the cleaning for vacation part, but, generally, he's a good sport and humors me with a bit of vacuuming and sweeping. I suppose it stems from childhood. My mother always required we clean house before we leave with the solid statement "it's so nice to come home to a clean house". Beau's correct really, in that our son will be here quite abit, and I'm sure some of his friends will come and go. So, no matter how much we clean, it's not going to be exactly the same kind of clean when we get back. But, it's a compulsion, now, and we must clean. 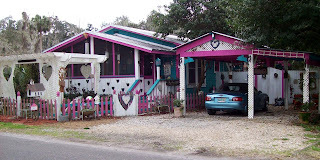 I'm a member of the Trading Post Guild, over at Artfire. This is, just what it sounds like, a guild of folks who get together to trade. Now, I'm not usually into individual promotion on my blog, but I just have to share this .... (here's the entire thread, if you are really short on things to read today). My sister collect Elephants and FFM had this vintage Avon set. I'm sure the earrings, I'll leave as-is, but I'm going to recreate the pendant for her into a full-scale necklace. The glass blocks ... well, they called me. This most incredible pendant polymer clay art pendant and a seperate ACEO print. A most wonderful eqyptian inspired necklace and anklet. 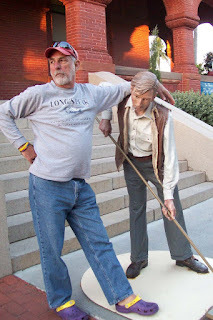 Now, I might have to put my ankles on a severe diet to get this guy to fit (I come from the big-ankle family), but its so incredible, if worse comes to worse, I'll just set it on my desktop and admire it daily ... like a fine piece of art. I agreed to trade one of my purses for this delightful necklace. BUT, had a small crisis. When I went to pull the purse to get it ready for shipping, I couldn't find it ... ANYWHERE. I looked and looked, even it places I knew it would never be. (I generally do a very good job of keeping items that are for sale organized and in there proper places). I finally came to the conclusion that it must have been stolen (I hate the word) at one of the craft sales I did late last year. (I'm going to have to come up with a system to check everything coming back in after an event). BUT, I went back and looked at this necklace several times, I the truth was, I really liked this piece and didn't want to cancel out the trade. So, I traded cash instead, and bought it. A Bead set ... the central bead is so nicely wirewrapped ... a skill I do not have, nor intend to gain, with four accompanying beads. I think I'm going to set these aside and it will become for focus piece for an upcoming gift. These events are such fun. First there is the fun and decision making of the trade itself, then followed up with the arrival of all the little packages. I imagine there will be another event in a couple months, and, they can COUNT ME THERE.